One little girl stands out especially in my memory, even though I only saw her for a few seconds. No more than six years old, she was digging through a pile of garbage in southern India. There was nothing unusual about the girl. In fact, I might not have noticed her if it hadn’t have been for the gigantic black pig digging through the same garbage pile. Just as we drove slowly past her, she looked up and caught my eye. While I sat comfortably in the car on my way to the hotel, she was struggling to find a little bit of food before the pig found it and gobbled it up. 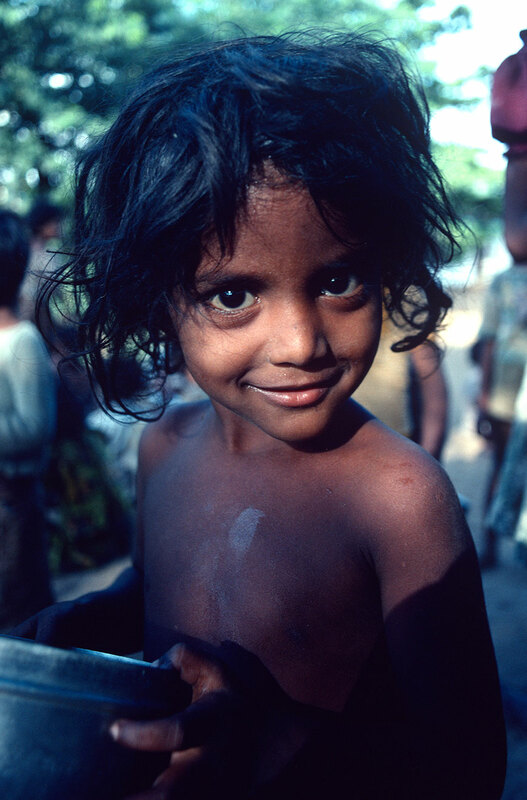 My first production in India, 1980, was a documentary film about the Swedish orphanage, Elida Children’s Home. That trip to India gave me experiences that have influenced my life in many aspects. We landed in Bombay (now called Mumbai) early one morning in April. We left the airport before 6 AM and the taxi dropped us off in the middle of the city where we walked along streets where people dressed in rags still slept or were just waking up. A few luckier individuals slept on collapsed cardboard boxes. I was only 22 years old and never experienced anything like it – thousands of people! Many were children that appeared so frail they probably didn’t have the energy to wake up again. Others sat up, rooting among their few possessions – a rag, a bottle, a cup. A few eyed me carefully. It was surreal – everything seemed to move in slow motion. Before embarking on this trip an older man told me, “When you come home you will be a completely different person. No one visits India without being deeply affected.” Why our Lord has given us such divergent circumstances and how we can find it so difficult to be grateful, are questions that have often crossed my mind. India has changed a considerably since my first visit in 1980, much to the better, but the memories remain. A few years later, in 1987, we filmed a series of educational films. I had also been asked to film some desert excursions for a Swedish charter company. Tourists rode on camels from Sakkare to the pyramids in Giza. (A fantastic experience that I’ve had myself.) Stopping at a small oasis with palm trees and Bedouin tents to rest, they were invited into the tents and offered a cup of tea. They moved on and soon two other women came rushing out of the tent. They were not happy. As they came closer I heard them griping, “Did you see the flies in that little child´s eyes sitting on the ground? So disgusting. How could the tour guides takes us to such a dirty tent and expect us to drink that awful tea?” They hurried away toward the camels, complaining loudly about their experience inside the Bedouin tent. People react so differently when confronted with something foreign or difficult to understand. You can face it with a positive or a negative attitude. When we’re looking for film ideas, we look for the good, the positive, even among the difficulties and problems. Our aim is to encourage hope and happiness even in situations that appear trying and despairing. If everyone could focus on the positive in life, what a celebration it would be.